Ever have problems trying to read your temperatures? Maybe you like to cook at night and checking the temperature will require extra lights or a flashlight. Perhaps you want to measure different parts of the grill to see which area is the hottest and which is the coldest. To solve these problems, you will need the best infrared thermometer you can find. An infrared thermometer is a laser thermometer that uses thermal radiation to measure temperatures in a specific area. They are called non-contact thermometers because you do not need to place the thermometer in the smoker or even on the meat. In this article, we review several different infrared cooking thermometers based on their price, special features, longevity, and capabilities of usage. How does an infrared thermometer work? When checking the temperature of a meat, area or cooking equipment with an infrared thermometer, all you have to do is point the thermometer gun at the area you want to measure the temperature of and pull the trigger to gain a reading. You do have to be within a specific range to use the thermometer accurately though. A laser is shot out on to the area which detects the amount of thermal radiation being emitted. The radiation power is then converted to an electrical signal which displays an accurate temperature. Before purchasing an infrared thermometer, you will want to do your research to find the best possible match for you because these expert grill thermometers can get pretty pricey. Make a list of your wants and needs along with a budget then cross reference with individual models to find the one for you. A rule of thumb when purchasing a very expensive thermometer is to try and get one that has a warranty or money back guarantee offered with them. Replacing parts on a thermometer is not ideal and a waste of time if you don’t know what you are doing. The majority of the time, when a thermometer breaks, there’s no fixing it. Make sure to find a model that is sure to last with strong durability and water resistance to protect it. If you are purchasing one online, make sure the company that ships it to you has good reviews for shipping and packaging. You never want a purchase to come in the mail broken or missing parts. What are the advantages of using an infrared thermometer? One of the best things about an infrared thermometer if you do not have to be directly in front of the area or item you intend on temperature gauging. Some allow to be up to 10 feet away from the grill and will still maintain an accurate temperature reading. This also means you do not have to touch the item area you intend on measuring the temperature of. This is why they are sometimes referred to as no-touch thermometers or non-contact thermometers. The temperature readings are almost instant, while as if you had a probe style thermometer, you may be waiting a while to gain an accurate reading. These thermometers are also not just used for grilling or barbequing. Use the infrared thermometer anywhere you want. They work very well to even test the temperature of a room. The laser does have to be pointed at an object to gain a reading off the surface though; these thermometers will not read thin air. These thermometers will also save on the energy they use. You may be able to use a digital thermometer that attaches to your grill and gives you accurate readings, but the thermometer needs to stay on always. This thermometer can be turned off once you gain the reading you desire. Of course, above we said to always look for a warranty on the thermometer to help replace it if it breaks, but there are a few other unique features that come in handy as well. Having a digital screen that has a background that lights up is very helpful when you are trying to read temperatures at night in the dark. Also, waterproof or at the very least water resistant will help protect your infrared thermometer from unwanted moisture. Dropping your thermostat in a bucket of water or leaving it out in the rain would surely ruin a thermometer very quickly. Make sure an infrared thermometer is right for you over all other thermometers. Each thermometer is unique is the sense that each has a specific job to help accurately read temperatures. Does an infrared thermometer give the best temperature readings? This device is one of the best kitchen thermometers money can buy for its easy to use, no mess to clean up and fast temperature readings. An infrared thermometer will give very accurate temperature readings, however, out of all the thermometers available, there are some that will give even more accurate temperature readings. While the infrared thermometer is handy and easy to use when using it to read temperatures, the farther away from the surface is detected, the less accurate of a reading you will receive. The reading s will not be off by much, maybe a few degrees which aren’t that big of a deal, but can be in some aspects. Measuring the temperature from very far away, the laser will sometimes detect emitting thermal radiation surrounding the area being used causing the temperatures to fluctuate. But at if you plan to lift the lid of the smoker and check the surface of the grill or meat inside, you will be more than fine and have accurate readings every time. This is one HOT infrared thermometer on the market currently, only because it is sold so often, making it a popular item. This thermometer also has a very cheap price tag, which could be a reason why it is so popular. This infrared thermometer can produce temperature readings for both very hot and icy surfaces with a temperature range between –58 degrees to 1044 degrees. We are not quite sure why you would need to be measuring a temperature of 1000 degrees, but in the off chance you need to, it can do so. However, there have been some complaints about the product not being able to accurately read temperatures. This could also be the cause of low battery life, moisture within the thermometer or damages to parts. The packaging and shipping of the product are very well thought out, and most packages arrive on time and intact. There have been a few occasions when the device came defected and was returned, then in the same cases took an overextended amount of time to receive a replacement. The battery is somewhat hard to replace and, on some occasions, has to be removed for the unit to be turned off. While this infrared thermometer has many different faults and short life expectancy, you can’t beat the price. Keep an eye out for this item to be back in stock soon if you are looking for a simple, cheap and basic infrared thermometer. This excellent infrared thermometer comes in to play fairly pricey. But with all the bells and whistles this gadget contains, you will be glad you splurged on a more expensive model. This laser thermometer has a wide range of gauging temperatures measuring as low as negative 22 degrees and as high as 1200 degrees. The temperature is calculated by not just one, but two lasers to ensure a more accurate temperature reading. The body of the thermometer is well constructed of quality materials making it drop resistant up to 3 feet. The frame is also encapsulated with an insulating layer to protect the inside from water and dust particles. With its ergonomically friendly design and shape, it makes it easy to hold in your hand. The thermometer is also equipped with a clip to attach it to the grill or yourself when it is not in use. The display is backlit with a led light to help gain access to better readings at night in the dark as well. However, there have been complaints that this feature does use more battery power, lowering the visibility of the screen at times. While this is one of the best infrared thermometers, you will want to spring for a warranty or at least try to obtain a manufacturer warranty because some of the pieces have been known to wear out after very little use causing bad readings. The trigger has been known to become loose and completely stop working altogether. This is a tremendous infrared thermometer especially for the price tag on it. This thermometer is about half the cost of the previous laser thermometer we reviewed and still has some cool features with it. The temperature range is still the same as the other one coming in at negative 54 degrees to 1200 degrees. It also uses dual lasers to detect the thermal radiation serving up two separate temperatures to make sure you receive the most accurate temperature possible. Although the body is not water or dust resistant, it is still constructed of durable quality materials to protect it from drops or falls. It also comes with a holster that you can attach to your hip and use whenever you want on the go, hands-free! The thermometer is powered by a 9-volt battery and tends to run out quite often with its dual reads and digital display with a backlit screen for night time temperature reading. But they do supply you with your first 9-volt battery to get you started. Probably the best thing about this thermometer model is that comes with a manufactures warranty of for ten years. They will replace any part that needs to be replaced except for batteries, and if you completely break the thermometer, they will replace it for free with only shipping costs to pay. This is a great thermometer to consider. This very reasonably priced infrared thermometer is very popular. With a very cheap price tag, there is no wonder why this product has been bought so many times. Could be perfect for anyone who wants to try out an infrared thermometer without actually spending that much money. The thermometer is powered by 2 AAA batteries that do have a tendency to burn out very quickly, but two batteries are provided with the original purchase. The screen does have an instant-read digital display but does not have any alarms or a backlit display making it easier to read at night time in the dark. The easy to grip handle and the long temperature detecting range of negative 58 degrees to 712 degrees, allows you to read the temperature from the smoker or grill at a safe distance with an accuracy ratio of 12 to 1. The model is not water resistant, dust resistant, drop resistant or does it come with any guarantee or warranties. There have been problems with the screen breaking or not reading, packaging and delivering errors, broken triggers, inaccurate temperature readings and damaged or missing parts upon arrival. But the thing you have to look at is the price, and you get what you paid for. Sure, you may be able to take very good care of this thermometer, and it will last for a long time, but in the long run, it won’t. But don’t worry, it was cheap. And that is why this is a perfect infrared thermometer to take for a “test run” without high expectations. This infrared thermometer is also very similar to the previous model. 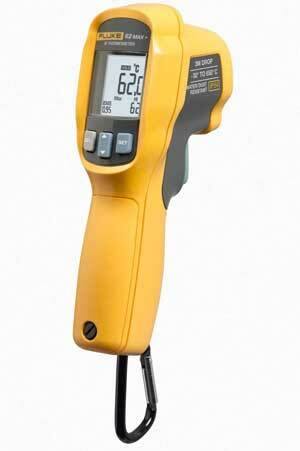 This product is very affordable, making this infrared thermometer quite formidable as well. Of course, for all the same reasons but mainly to use as a tester before buying a “big boy” infrared thermometer. A great choice if you don’t care about all the extra special features with the more expensive models and want a thermostat that is affordable. The thermometer does have a huge temperature range of negative 58 degrees all the way up to 1022 degrees, so it does have a little bit larger of a temperature range. However, there have been complaints of inaccurate temperature reads which could be due to all sorts of different problems. But they both have the same accuracy ratio of 12 to 1. The thermometer contains a led digitally lit screen with a backlit display for reading temperatures at night time in the dark. It also has an alarm, a storage for storing temperature data and a low battery indicator. The battery does drain quite quickly which uses a 9-volt battery. The battery also does not fit well within the device, and there have been complaints of the cover breaking, coming off or falling apart. Of course, with the usual complaints of the unit breaking, being poorly packaged and delivered or giving inaccurate temperature reads, the thing is this product is very cheap. It’s a steal but does not come with any warranty, so this infrared thermometer is best if you are on a budget or just fooling around and don’t care about the cost or unique features of other infrared thermometers. What temperatures do infrared thermometers measure? Infrared thermometers can read very high temperatures as high as 1500 degrees. They can also detect very cold temperatures down to about negative 200 degrees. Reading temperatures this high or low is not recommended, nor is it necessary. To receive more accurate temperature readings, try and only detect temperatures more with the norm of cooking with a range of 0 degrees to 500 degrees. This all depends on what type of temperatures and surfaces you intend on gaining readings from. If you wish to increase the internal temperature of a smoker or grill while it is cooking, any probe thermometer will help you the best. If you want to measure the internal temperature of food, then you will want a meat thermometer or probe thermometer. If you want accurate temperatures from a safe distance without having to touch anything, then an infrared thermometer will give you the most accurate readings. What powers an infrared thermometer? For the most part, these thermometers are battery powered to operate. The cells can be as small as watch batteries or even as big as 2 AA batteries or a 9 volt. It all depends on the thermometer. Some of the best infrared thermometers have an internal battery that can be recharged using a USB adapter or phone charger as well. These will come in handy, but the battery made be hard to change when it comes time to replace a defective one. Can I use an infrared thermometer as a stationary grill thermometer that constantly reads the temperature? No. Infrared thermometers are meant to be used in an instant and are not designed to attach to a grill or smoker. They also don’t tend to do well when left around high temperatures since they are not built that way and will melt, fall apart and damage the internal thermometer. If you want a thermometer that does this the best you should check out a probe thermometer or a digital thermometer with Wi-Fi or Bluetooth capabilities. How do I take care of an infrared thermometer? An infrared thermometer should be stored in a cool, dry and dark space to avoid damaging the thermometer. Also, even if your infrared thermometer is dust and water resistant, try to avoid bringing it in contact with those elements. Just because it says it can hold up to these elements, does not mean you should test to see if it does. Avoid dropping the thermometer by using an adjustable clip or holster to hold it when you are not using it. Try to keep your children away from it as well; infrared thermometers are not toys! Just try to take general care and upkeep of the thermometer, and it should last you for years to come. So, what is the best-infrared thermometer readily available for purchase? The clear winner is the monologic Temperature Gun Dual Laser Non-Contact Infrared Thermometer for so many different reasons. First and foremost, this is the only thermometer on the list that has a warranty attached to the original purchase and not only that, but it is a 10-year warranty. If anything breaks, becomes damaged, pieces go missing or are poorly delivered; the manufacturer will either fix the product or send you a new one free of charge. With the dual laser technology and a digital interface, you are sure to get excellently accurate temperature readings every time. The screen also makes cooking at night or in the dark easy with a led backlit display, alarms and notifications. The original purchase comes with a free battery to power on the device and a leather holster which latches and attaches to your hip, pants or belt for easy to reach use and hand free storage while not in use. With all the cool features, free gear that comes with it and the 10-year warranty, it is also very reasonably priced, so you won’t break the bank purchasing one. For all these reasons and so many more is why we chose this thermometer to be the best-infrared thermometer for cooking and measuring temperatures of just about anything.